Back cover blurb: What secrets would you kill to keep? After her husband’s big promotion, Cece Solarin arrives in Brighton with their three children, ready to start afresh. But their new neighbourhood has a deadly secret. Three weeks earlier, Yvonne, a very popular parent, was almost murdered in the grounds of the local school – the same school where Cece has unwittingly enrolled her children. Already anxious about making friends when the parents seem so cliquey, Cece is now also worried about her children’s safety. By chance she meets Maxie, Anaya and Hazel, three very different school mothers who make her feel welcome and reassure her about her new life. That is until Cece discovers the police believe one of her new friends tried to kill Yvonne. Reluctant to spy on her friends but determined to discover the truth, Cece must uncover the potential murderer before they strike again . . . So I have a deep affection for Dorothy Koomson's novels, and they seem to get better with every one she publishes. CeCe Solarin is a newcomer to Brighton. Her husband has a fancy new job and her twins have just been enrolled in to the posh local prep school despite CeCe's principles and protestations. Little does she know that she has every right to be concerned about her choice of School. Three weeks before the Solarin's arrival in Brighton local parent Yvonne was found brutally attacked and left for dead within the school grounds. Now in a coma, her three best friends are all studiously avoiding Yvonne's husband as they know he will ask them questions about the night she was attacked. The truth is although all three of them are adamant they didn't attack her, they all know something about that night, and they all have something to hide. CeCe who knows nothing of what has happened previously is slowly integrated into the friends group. They make her feel welcome, and reassure her about her move. When CeCe discovers that the local Police believe one of her new friends could have something to do with Yvonne's attempted murder she is horrified. But she doesn't believe that any of them are capable of such a crime, and so she begins her own investigation. It turns out that we all have that one friend like Yvonne, someone we think we know until it is too late to detach ourselves from them. Did Yvonne tip one of her friends over the edge, or did someone else have grudge to settle? 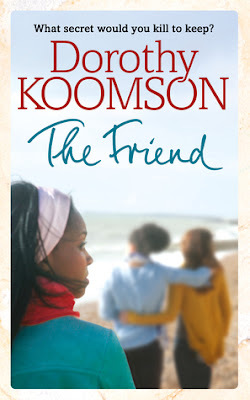 The Friend is another gripping novel from Dorothy Koomson, and I just loved the ending. Beautifully done! The Friend is available from 1 June 2017. Thank you to the publishers and lovereading.co.uk who sent me an advanced proof copy of this novel in exchange for an honest review.